The brown marmorated stink bug, Halyomorpha halys, is considered a serious invasive species capable of causing significant agricultural and nuisance problems. 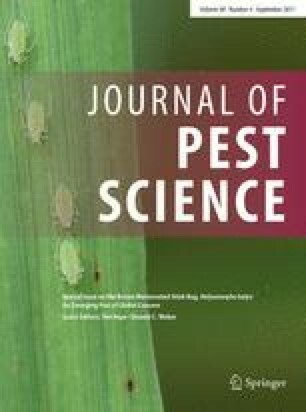 Researchers in the USA recently identified the two-component H. halys aggregation pheromone from populations in North America and found that when it is combined with the pheromone synergist methyl decatrienoate (MDT), it resulted in reliable, season-long captures of H. halys throughout the USA. However, no study has assessed whether H. halys populations in the native range are attracted to and can also be reliably captured by the combination of these stimuli. In this study, our goal was to evaluate the response of H. halys adults, nymphs, and non-target organisms to traps baited with the aggregation pheromone, MDT alone, or in combination at three locations in the native range. Traps baited with combined stimuli reliably captured the greatest numbers of H. halys adults and nymphs, and traps baited with either lure treatment caught a unique community of non-target organisms. In addition, Plautia stali was cross-attracted to the H. halys aggregation pheromone. Overall, we demonstrate that the pheromone-based tools developed in the USA may be used for worldwide detection and surveillance programs for H. halys and P. stali. We would like to thank J.J. Ahn (West Virginia University), J. Cullum (USDA), J.T. Goldner, Dr. Sang-Ku Lee, and M.M. McKinney for their excellent technical assistance. This work was funded by a Cooperative Research Program for between Agricultural Science and the Technology Development and the Rural Development Administration, Republic of Korea (Project No. PJ008946), Cooperative Research Agreement between the Rural Development Administration of the Republic of Korea and West Virginia University, USA (Project No. 10016999) and National Research Foundation of Korea (Grant No. NRF-2014R1A1A2056993). This research was also funded, in part, by a USDA-NIFA SCRI CAP Grant#2011-51181-30937. Mention of trade names or commercial products in this publication is solely for the purpose of providing scientific information and does not imply recommendation or endorsement by the US Department of Agriculture. All authors declare that they have no conflict of interest in publishing this work. All applicable international, national, and/or institutional guidelines for the care and use of animals were followed. This article does not contain any studies with human participants by any of the authors.